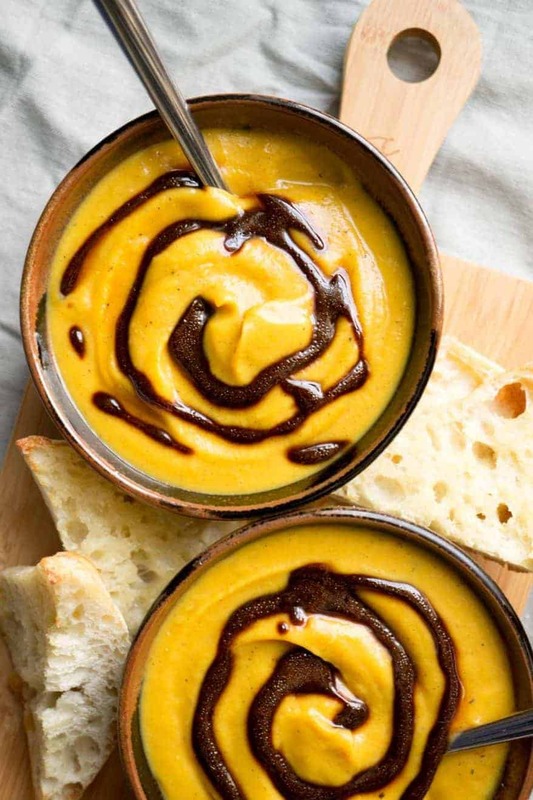 This soup is silky smooth (especially if you use a Vitamix blender! ), slightly sweet, and 100% delicious! 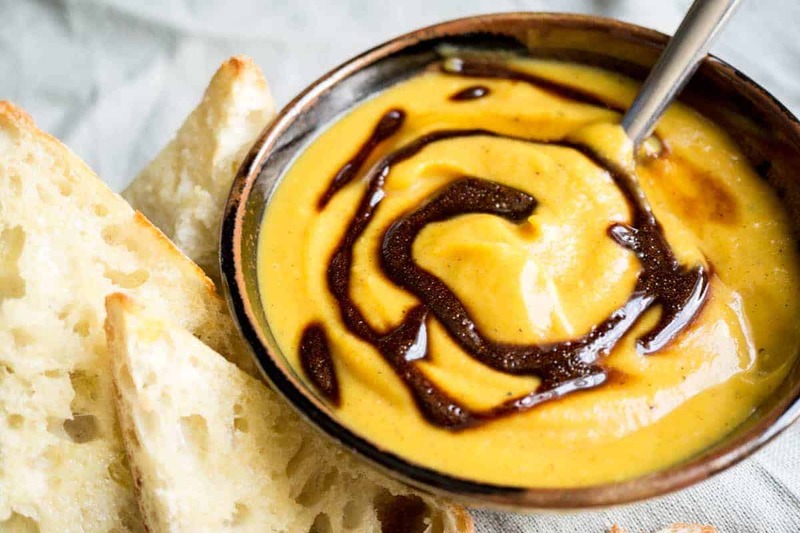 The inspiration for this carmelized apple and butternut squash soup came from a soup we had on our recent trip to New York. And when I say “inspiration” I mean I tried my best to replicate it ingredient for ingredient! We lucked out in the timing of our trip: it was restaurant week in the Hudson Valley! Various upscale restaurants were featuring 3 course lunches for $21. We weren’t overly hungry so we decided to share. But this restaurant knew a thing or two about portion sizes and there didn’t end up being enough food for the three of us. We’re so used to just sharing our meal with Judah but now that he’s three he actually eats a decent amount of food on his own! So we ended up getting another 3 course lunch! It was a lot of fun to try the different courses! The next day we headed upstate and found another restaurant participating in restaurant week. This time we just went ahead and ordered two sets of courses. In an ironic twist of events, this restaurant served very generous sized portions! So we packed the main courses up for supper that evening. A mysterious phenomenon occurs when food and liquid are combined to make a soup… you end up with a very filling meal! If you ate the same foods in solid form while sipping on water, you would end up eating more calories than if you ate the soup. Our brains get tricked into thinking the water is satiating when it’s part of the soup. Weird, but true. Eating soup is a great strategy if you’re trying to eat less food overall. You don’t feel deprived, you end up just naturally eating less. Win win! A warm and earthy soup with sweet notes of carmelized apples. Slice the butternut squash lengthwise in half. Scoop out the seeds and put aside (you can bake and eat them later, if you wish). Place the two halves cut side down on a baking sheet. Slice the top tip off the head of garlic. Drizzle the olive oil on top and wrap in tin foil. Place on baking sheet. Core and slice the apples. Peel and slice the onions. Place the apples, onion, butter, cinnamon, cloves, and nutmeg in a large frying pan. Saute on medium low until the onions start to turn a golden brown. Stir occasionally. In a blender puree the squash with 2 cups of the broth, the salt, the pepper, and the maple syrup. Pour into a large pot. Place the carmelized apple/onion mixture and the remaining broth in the blender and puree. Pour into the pot. To make the glaze, heat and stir the balsamic vinegar and maple syrup in a small pot over medium heat until thickened. 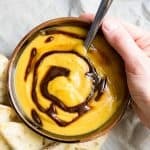 If you don’t want to go the extra step and make the glaze, this soup also tastes delicious without it! Disclaimer: this article contains affiliate links for products mentioned. Holy gorgeous. This stuff looks SO good! Love the idea of doing caramel and apple in a soup. Total genius!